It is now possible to "clone" a person's facial expressions and facial mannerisms in real time. This data can be associated with a CGI head to let a computer masquerade as a real person. “Spoken words are supplemented with non-verbal visual cues to enhance the meaning of what we are saying, signify our emotional state, or provide feedback during a face-to-face conversation,” says Dr Barry-John Theobald, computing science prof at the University of East Anglia. 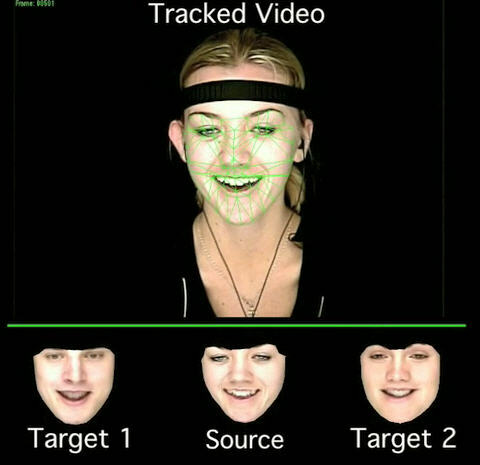 This kind of technology could be used to allow computers to implement highly realistic characters to communicate with people. For example, in the Star Trek episode The Return of the Archons, a computer presents itself as Landru. An earlier example is presented by Robert Heinlein in The Moon is a Harsh Mistress. The sentient computer MYCROFT creates a computer generated image of "Adam Selene" the imaginary leader of the lunar revolution. I added the bold emphasis - pretty accurate description of what you're seeing in the first picture above from forty years ago, which is a still taken from a video. From Expression Cloning via The Register. Thanks to Winchell Chung for the tip and a reference.